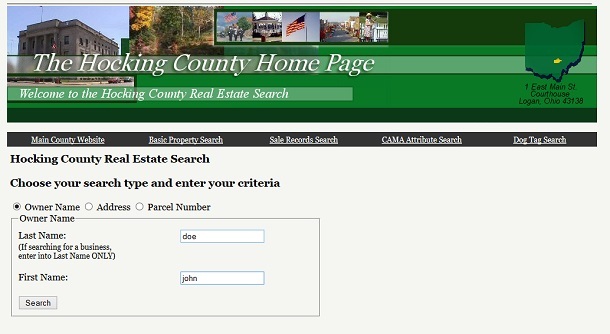 Go to the Hocking County Real Estate Page and search for the property that you want to pay for. 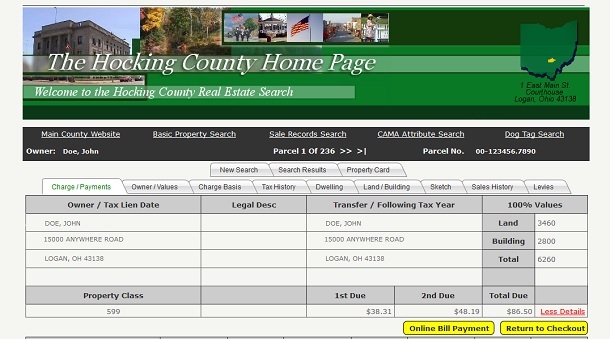 Click on the Bill Payment Link below the property information. If the Bill Payment link is not available, you do not have a current balance. Please contact the Treasurer to set up a pre-pay account in order to make future payments. You will now be sent to the payment confirmation screen. Please change the amount that you wish to pay in the yellow box and then click the Pay Now button. After this screen you will not be able to change your payment amount, please make sure it is correct before proceeding. The next screen takes you to our payment provider, LexisNexis. At the end of the checkout process you will be able to print a receipt. Payments made after 11:59 P.M. will be applied on the next business day. Any payments before Midnight made on a due date will be applied on that day.